With an outburst of offensive power, the Devils won two of three games last week and seem to be finding their groove, slowly but surely. New Jersey beat the Philadelphia Flyers, 3-0, on Thursday; fell to the Toronto Maple Leafs, 2-1, in a shootout on Friday; then bounced back to demolish the Nashville Predators, 5-0, on Sunday. 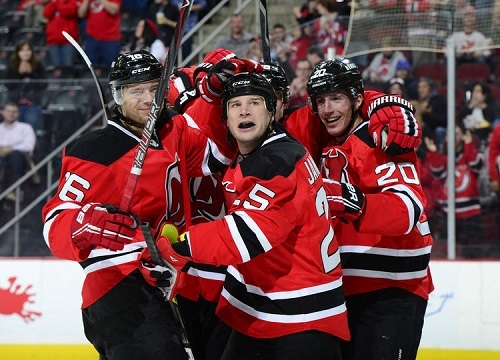 The Devils nine goals last week were the most they’ve scored in that time frame all season. Seven different players scored the goals while 10 different players tallied assists. Against the Predators specifically, thirteen different Devils recorded points, including a two-point night from both of the Devils leading scorers, Jaromir Jagr and Marek Zidlicky. New Jersey benefited from goals from: Jagr from Peter Harrold and Andy Greene; Cam Janssen from Ryan Carter and Zidlicky; Zidlicky (power play goal) from Eric Gelinas and Adam Henrique; Travis Zajac from Jagr and Dainius Zubrus; and Mattias Tedenby from Andrei Loktionov and Steve Bernier. Against the Flyers, Henrique scored from Gelinas and Michael Ryder; Janssen scored from Adam Larsson and Carter; and Jagr scored an empty netter. Ryder tallied the Devils only goal with assists from Gelinas and Greene against the Leafs. Spreading the wealth offensively bodes well for the depth of the team, especially considering that Patrik Elias still isn’t playing due to an upper body injury. Patty being out obviously is bad for the Devils, but it’s good to know that the team can win without its all-time leading point on the ice. That is in large part due to Jagr, who recorded his 1,700th and 1,701st career points on Sunday, and sits in eighth all-time in the NHL. Just ahead of Jagr is his former teammate on the Pittsburgh Penguins, Mario Lemieux, who finished his career with 1,723 points. It took a few games for Jagr to find his place with the Devils but putting him on a line with Zajac and Zubrus has turned out well. NEWARK, NJ – NOVEMBER 10: Travis Zajac #19 of the New Jersey Devils is congratulated by Dainius Zubrus #8 and Jaromir Jagr #68 after scoring his 100th NHL regular season goal against the Nashville Predators during the game at the Prudential Center on November 10, 2013 in Newark, New Jersey. The Devils shutout the Predators 5-0. Jagr leads the team with 13 points (five goals, eight assists) while Zidlicky has 11 (two goals, team-high nine assists). A few weeks ago I downplayed Zidlicky leading the Devils in assists, and while I’m still not fully convinced that he’s a great fit for the team – he has a -3 rating, which is about middle-of-the-road for Devils defensemen right now – he has had a good week so I’ll go along with that for the time being. Two more players who had a good week are Gelinas, who recorded one point apiece in each of the Devils three games and has tallied five points (one goal, four assists) in his eight games, and Janssen, who scored two goals this week after being called up from the Albany Devils just on Wednesday. Goalie Martin Brodeur notched both shutouts last week, the first time since April 2010 that he’s recorded back-to-back shutouts. He stopped 22 shots by the Flyers and 15 by the Predators to record his league-leading 122nd and 123rd shutouts; Sunday night marked the first time he has ever held the Predators scoreless. Additionally, Brodeur helped the Devils remain perfect on the penalty kill on Sunday night, blanking the Predators during all six opportunities. NEWARK, NJ – NOVEMBER 10: Cam Janssen #25 of the New Jersey Devils is congratulated after scoring a second period goal against the Nashville Predators on November 10, 2013 at the Prudential Center in Newark, New Jersey. The Devils head to Madison Square Garden Tuesday night to face the New York Rangers who are on a three-game win streak, during which they’ve scored thirteen goals. Later in the week, the Devils return home to the Prudential Center for back-to-back games against the Los Angeles Kings and the Metropolitan Division-leading Pittsburgh Penguins. Plus: Longtime New Jersey Devils defenseman Scott Niedermayer was inducted into the Hockey Hall of Fame on Monday night, joining Chris Chelios, Brendan Shanahan, Geraldine Heaney, and Fred Shero. Minus: The Devils still haven’t scored a shootout goal this season—they’re 0-for-22. No but seriously.